IPredator's speed, advanced extras and log-free torrent support could be appealing – if you can live with a Swedish-only IP. IPredator is a Swedish VPN co-founded back in 2009 by The Pirate Bay's Peter Sunde. If you're interested in bypassing geographic blocking, this won't be the service for you. IPredator claims to have more than 100 servers, but they're all in just one country: Sweden. That's still enough to maintain your anonymity, though, and the company offers several more interesting privacy extras: a public Jabber instance, a non-logging web proxy, uncensored DNS servers, a Tor server running as an exit node, and even a private IRC server to get some speedy support. The service supports OpenVPN and PPTP protocols on up to two simultaneous connections, there's an IPv6 server, and you can sign up for a static IPv4/IPv6 address, if you prefer. The price seems a little high for what you get at €6 (£5.60, $8, AU$8.40) for a single month. 3, 6 and 12-month plans are available, but unusually they don't provide a discount. You can also get a 3-day trial. This isn't an automatic part of the signup process – you must email support and ask – but it's speedy enough, and we received a friendly reply inside of an hour. Refunds might also be possible, although the policy is a little vague. IPredator says it offers money back if the service "really does not work for you", and "you try to fix the problem with our help first." They're not restricting you by time or bandwidth used so it's not all bad, but there's still lots of scope for the company to say no to any potential refund. 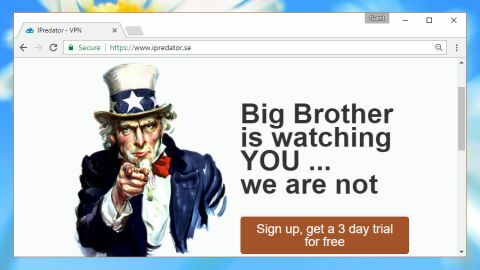 IPredator's website has a neat headline which combines its monitoring policy and reason for existence: "Big Brother is watching YOU. We are not." The core details are summed up elsewhere. The company doesn't log or ‘look into’ your traffic. There are some connection logs to help with debugging – connection drops, firewall issues, authentication failures (such as logging in with the wrong password) – but not enough to tell anyone anything about what you're doing online, and even these details are held encrypted and off-site. IPredator keeps the bare minimum of details on individual users: your email address, username and password. There is a separate database which holds a link to a transaction ID for the payment processor, which has to be kept to deal with complaints or questions, but this is deleted in "a bit over 6 months". Even these details will only be handed over if the Swedish authorities can make a case that they're related to serious crime, where someone will eventually be imprisoned (murder, major fraud). There are a few other interesting privacy-related features we noticed elsewhere. IPredator says it doesn’t have an affiliate program, for instance, because that would mean it would have to track where you came from to pay the affiliate. A thoughtful objection which we've not seen elsewhere. IPredator has no clients of its own, and although there are setup tutorials available for Windows, Mac, Linux, Android and iOS, they're really not aimed at beginners. The Windows OpenVPN page suggests using Viscosity for a "more integrated client which handles administrator permissions properly and thus adjusts the routing table correctly", for instance. That's reasonable advice, but it won't mean much to the average user. Launching the Windows tutorial and seeing ‘Step 1 of 29’ might be intimidating, too, although it's not as bad as it seems. Almost every click is a separate step (click Agree, click Next...), and it fits in some helpful configuration advice towards the end. Life gets considerably easier when you're up-and-running. With only one location (Sweden) there's no need to choose or change anything – just click Connect to start, and Disconnect when you're done. In our tests*, we couldn't fault performance, either. UK-Sweden download speeds were 30-35Mbps at a minimum, often much higher, and upload speeds were also well above average. That's a good start, but keep in mind that you may see very different results – better, or worse – depending on where you are. With just one location and zero clients, IPredator isn't a VPN for the average user. But if you know what you're doing and can live with a Swedish-only IP, you'll get high speeds, torrent support and a clear no-logging policy.